There’s no doubt the DSR5BT has an impressive feature list, a high level of performance and really well-balanced sound. But the £349 price point is a little off-putting. That makes this pair £100 more than the Bose QC30 or the Sony WI-1000X. It’s arguably a better pair than both, but perhaps not £100 better. Audio-Technica is the brand for audiophiles who aren't also mega-rich. So if you want quality, well-balanced sound but don't want to spend thousands, it's a brand to look at. That's true whether you want sensibly priced but fantastic noise-cancelling headphones, or if you want a record player. The ATH-DSR5BT in-ears has the same digital drive performance of the over-ear DSR9BT, but in a neckband package. At £349, however, the question is whether they deliver significantly better performance than the other competitors in this field? We've tested a lot of neckband earphones over the past couple of years. Predominantly because that seems to be the standard form factor for in-ears now. Either that, or completely wire-free models designed to rival Apple's AirPods. There is an advantage to this style over wire-free, perfectly exemplified here: having a decent amount of housing space inside a collar means you can have more powerful batteries and wireless components, which makes for performance and (often) better sound. What's more, with the Bluetooth radio being closer to the source of audio - which is likely in your pocket - you're less likely to get any connection drop-outs. In Audio-Technica's case, the earphones are built with a considered approach to looks, and with some high-quality materials. 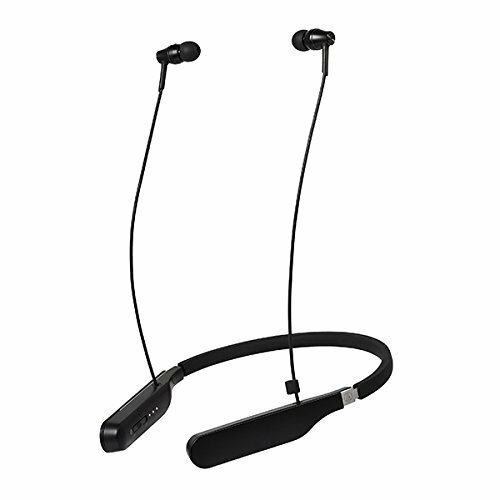 Running through the entire neckband is a thin, flexible strip of aluminium, ensuring it keeps its shape, bends enough to fit around your neck and is strong. The back portion that rests on your neck is covered in a thick silicone material, to ensure that it's comfortable to wear. On each end of this "horseshoe" you'll find the plastic housing that curves into the neckband and also contains all the controls and buttons you need. We're really happy to see there's no inline remote dangling from either of the ears, which means the fit is really well balanced. The power switch slides on/off on the right hand side, while the play/pause and two volume buttons are on the left. There's also a handy three-LED indicator to let you know how much battery remains. There are only a couple of small issues with the design. First, with the earbuds being really quite dinky, there are no magnets built into them, so you can't just snap them together when not in use. Secondly, the little clip that's built into the cable - which allows you to attach them to each other to stop them dangling loosely - is quite fiddly and not overly convenient. It's not a big deal, but a little improvement would be welcome. The only other minor downside to the aluminium core in the neckband is that - unlike the ones that use essentially just a thick, really flexible cable - is that it can't mould as well to the base of your neck. We didn't once feel uncomfortable, so again, not a major problem. While the fit of the neckband is brilliant, the standard silicone tips shipped with these earphones might not be to everyone's taste. We found our left earbud often became loose as the silicone slipped slightly out of position. Using a larger earbud just made it uncomfortable to wear. It'd be a fairly simple problem to solve, and could be done by simply shipping the earphones with memory foam tips as well as standard silicone ones. Of course, you can always buy your own and fit them yourself, but we feel foam tips should be standard in any earphones - especially ones that cost so much. There's no use having a well-made pair of great-sounding earphones if basic performance issues tarnish the experience. Thankfully, this pair is A-OK in that department. Bluetooth 4.2 may not be the latest standard, but it's still more than good enough for a pair of earphones. The connection was flawless in all of our listening; we didn't notice any cutting out or momentary jitters - even when we moved to the next room but left the audio source on the desk. Similarly, when out and about, walking to-and-from the train station, or listening on a busy street, the connectivity remained solid. And the eartips do a good job off passively cutting out surrounding noise too. Battery wise, we got pretty close to eight hours of usage from a full charge, before feeling the need to plug it in via its - now outdated - Micro-USB cable. Given that eight hours is what Audio-Technica promises, it's not too much of a shock to find it coming close to that figure. It's not mind-blowing longevity, but it's good enough. It'll get you through almost a full work week's worth of commutes. Still, it pales in comparison to RHA's 12 hour battery on the MA750i, which is also much cheaper. Like some of its flagship over-ear headphones, these in-ears have AT's Pure Digital Drive processing, so no digital-to-analogue converter is required. The chip controls the driver output directly with digital signals. And the driver make-up is rather interesting: it has a dual phase push-pull system made up of one 9.8mm driver and an 8.8mm driver. Like we said already, the result of all this is really clear, well-balanced sound. Regardless of the kind of music we listened to, vocals were clear, as were subtle details in the backing tracks. Bass is clear enough, but bass-heads won't be happy with the level of it. We wouldn't call the low-end sterile or completely flat - you can still hear it clearly, and it's good quality - but it's just not as brain-wobbling as we'd like. If you're an audio purist who insists on there being a precise balance between treble, mids and bass, you'll likely love the Audio-Technica sound. Nothing overpowers; all elements retain clarity and sustain regardless of genre. While passive noise -ancelling is good, it's a bit of a surprise in an earphone this pricey to find that there's no active noise-cancelling (ANC). It's a feature slowly making its way to in-ears, particularly neckband ones, and a feature that should be standard. There's no doubt the DSR5BT has an impressive feature list, a high level of performance and really well-balanced sound. But the £349 price point is a little off-putting. That makes this pair £100 more than the Bose QC30 or the Sony WI-1000X. It's arguably a better pair than both, but perhaps not £100 better. Despite how great it is as a pair of earphones, there are a lot of "could bes" given the price tag. Build could be more flexible, sound could be more bassy, there could have a USB Type-C connector instead of Micro-USB, it could be waterproof, it could have active noise-cancelling, it could have Bluetooth 5.0, memory foam tips and a better battery life. In the end these Audio-Technica in-ears do sound really great, are comfortable to wear and work really well. But they aren't half pricey. Sony's 1000X range of earphones and headphones is superb, offering great sound, some useful noise cancelling tech and premium looks. You can customise the sound to suit you and, although not cheap, they're still not as expensive as the Audio-Technica pair. Classy design, high end materials and a really practically designed neckband make the RHA MA750i very attractive indeed. We're not big fans of the over-ear hooks, but the £149 price point is far lower than the performance dictates it should be.